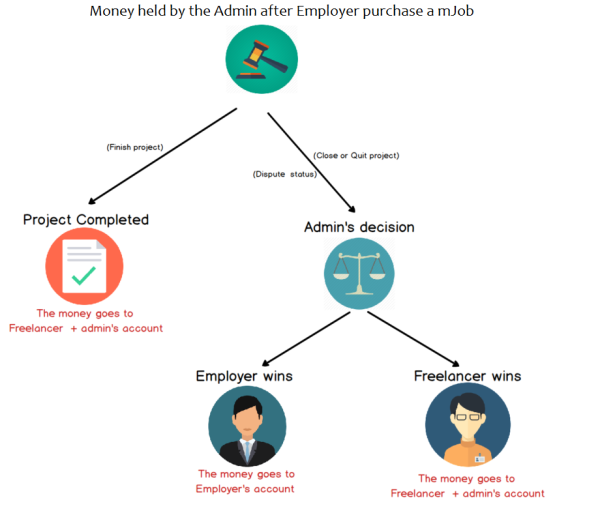 [MjE] Where the commission fees for admin goes after order completion? Step 1: When Employer pay for a mJob, he will pay the budget (example: $10) to Admin’s account like paypal . Step 2: This project will change its status to “Processing”. If the employers “FINISH” this project, the process will move to step 3. Otherwise, the employers “CLOSE” or freelancers “QUIT” this project, it will turn the status into “dispute” and process will jump to step 4 . Step 3: After the employer clicks “Finish” button, this project’s status will become into “Completed”. Step 4: The freelancer and employer will send their reports to Admin, and Amin will decide who the winner is in this case. So the money is in admin’s account the whole time. Site admins must transfer each withdrawal request amount manually via Paypal or Bank account. Hope this could clarify your uncertainty. [MjE] How admin see conversation between members? [MjE] How job verification work? [MjE] Is it possible to send a review without buying a service? [MjE] Why geolocation search is a really important feature, why you don’t implement it? [MjE] Do you have these social logins: QQ, wechat, linkedin, etc.? [MjE] Do you have have wechat pay and alipay?